We always knew that Tina Turner is a survivor, a Soul Survivor even who sang “I Might Have Been Queen” down in far-away Egypt on the river Nile cracking criminal cases with Hercule Poirot. But halt! There is yet another river, a small but important river in Germany, the river Ruhr which is also the name given to Germany´s most populated agglomeration with 5 million inhabitants: the Ruhr Region (or “Ruhrgebiet” in German). And it is exactly there where one of the biggest miracles in show business advertising or at least in the realm of live concerts marketing could be seen: Tour Posters advertising shows in 1987 hanging and hanging under a highway bridge for an eternity. 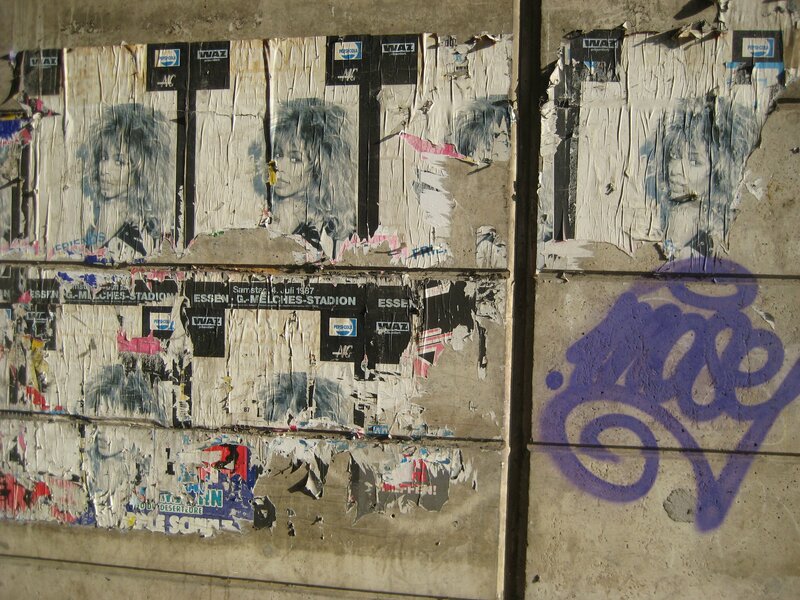 According to an informant who lives nearby: everything is now history – but not forgotten because we are about to tell you about the Tina Turner 1987 tour posters which simply survived year after year under that highway bridge until the years piled up to nearly 3 decades. You could say that the Ruhrgebiet was actually soaked with Tina Turner in the 80s. No wonder then that the following story could unfold only here – the story of the posters which survived for 30 years and now even have their own Facebook page!. There are so many cities side by side stretching from Dortmund in the East to Duisburg in the West – and some people even extend the agglomeration to Düsseldorf in the South-West because it is just another 30 km or 20 minutes on the highway – with each city having enough inhabitants that there is at least one big concert hall ranging from 5,000 up to 15,000 or even soccer stadiums that you can easily compare it to US cities like Chicago or Los Angeles where top artists can easily play in the city proper as well as in adjacent cities which all look like one big city if you don´t zoom in enough on a map. Long story short, in the pre-Private Dancer era she played in cities like Bochum (300K inhabitants), in 1985 and 1987 you could buy concert tickets for her shows in Düsseldorf (600K) , Essen (570K), and Dortmund (580K) with the latter one being the hot spot as they had back then the biggest indoor arena of Germany: the famous Westfalenhalle where she did not play only one show but several in a row. Side note: Every Tina fan should be familiar with this arena as the live segments for the „Break Every Rule“ video were shot here while the outdoor shots were taken in Essen and on the highway A40 in the Ruhrgebiet. Additionally, the live version of „Paradise Is Here“ – the B-side of the single release of the same name – is from one of the Westfalenhalle shows. And finally: the famous group photo of the „Live In Europe“ double album pictures Tina Turner, band, and the whole crew in front of this special venue. When you see the photos or when you actually happen to be at the site you ask yourself: How could that happen? How is it even possible for posters to remain there for years and years and years? The spot itself is a non-location: the highway crosses the city and represents the northern artery of traffic in the Ruhrgebiet. Next to the street and the location is a small castle which boasts its exibition of the city´s history and has absolutely no shame of letting history begin some 10,000 years ago. Nevertheless, 1000s of cars and surely 100s of pedestrians go by day in day out. You simply have to go under the bridge in order to go downtown or to leave the city center. The small castle and its surrounding park are fare more interesting than the bridge or the highway. It is simply a place where you arrive or depart because you can enter and leave the highway but definitely not a place where you would like to stay – except during rain because the bridge can serve you as a shelter. The grey 30-40 meters of the bridge appear rather like a tunnel than an actual bridge, and the posters are stuck to the wall of that tunnel. It is either coincidence or fate that nobody in these nearly 30 years decided to stuck different or new posters to the walls. But maybe they did! And then Tina Turner crawled again back to where she belongs: to the top. Maybe she ripped all these new posters apart, broke every rule, was the thunder and the lightning and proved to be an overnight sensation. We will never know for sure – but she remained there hanging on the wall, persisted to hang there until the end of the 80s, continued to advertise this famous Saturday in 1987 while she was playing her „Foreign Affair Farewell Tour“. She even stayed there until she came back to the region in 1996, saw the new millennium and decided to go on and on. It is a shame that nobody cared about the wall and that the city council never decided to renovate or repair the wall and that they even forgot to clean the spot. 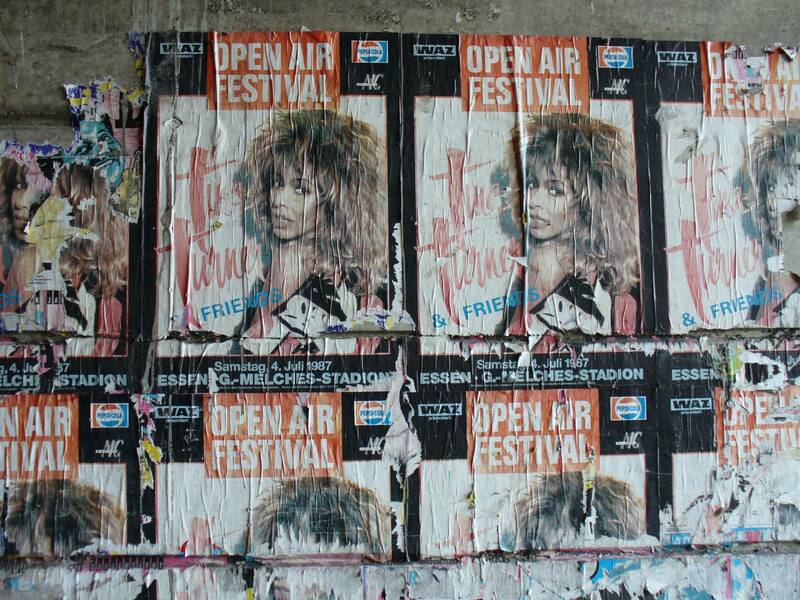 But maybe nobody dared –and after all these years the posters and their fading colors became a piece of art and the proof that once Tina Turner was playing in Essen, on a certain Saturday in the summer of 1987. The most accurate address is Bahnhofstraße, 44629 Herne, Germany. And no, the posters don´t have their own house number. As any other famous people like Harry Potter you have to add something like “cupboard under the stairs” to this not-as-accurate-as-you-might-wish address. In this case, you have to find the bridge of the highway A42 which crosses the Bahnhofstraße at this very spot. You can also leave the highway here so you can always add the bridge to any trip in the Northern Ruhrgebiet. The name of the exit is “Herne Baukau” and has the exit number 22. So the final address would be something like “Bahnhofstraße, 44629 Herne Baukau under the bridge of the A42”. The exact address on Google Maps shows that the posters can indeed be found under the highway although it looks as if you have to be on the highway but Google still has to invent the z-axis for displaying geographical content. The photos throughout the years speak volumes. We only managed to take photos for the blogs in the years 2010+ so again a call for help: if anyone of our readers has more photos and also photos from the years before 2010 like – and isn´t that just incredible? – from the 90s or 80s, don´t hesitate to send them. We would be happy to create a real science project out of them. After nearly 25 years you could still read the text on most of the posters. They advertise an open air festival during the “Break Every Rule” Tour which took place in Essen at the Georg-Melches-Stadion, the biggest stadium in Essen but more or less a field without many seats or any other fancy stadium features. The date: 1987, 4th of July, surely a bright and sunny Saturday. The poster features Tina Turner in a signature BER pose, left shoulder exposed and looking around to the viewer showing lips and huge 80s hair. What would you do if you found out that there are still posters on the wall from nearly 30 years ago? Yes, you better pose in front of them and take one selfie after the other. Tina Turner is indeed waterproof and youthful.